Over 50 years the production and study of Machin definitives has provided collectors with endless opportunities for expanding their collections from the very basic to the extremely complex. This has entered a new phase in 2018 with the contract for Post Office counter sheets moving from De La Rue (DLR) to International Security Printers Walsall (ISPW or Walsall). The counter sheet stamps printed for new postage rates effective 26th March 2018 were printed by Walsall. This had happened once before in 2013, when De La Rue were moving their plant to a new factory, and three new values (78p, 88p & £1.88) were printed by Walsall as an interim measure until DLR were ready to resume printing. When news of the 2018 new tariff printings broke, nobody outside Royal Mail and the printers knew whether this was the start of a new contract for all counter sheet stamps, which had previously been printed by De La Rue. The new values were £1.25, £1.45, £1.55 and £2.65, but the new tariff also required more £2.25 stamps - the fact that new January 2018 printings of these were also by Walsall reinforced the belief that that would now be printing everything. "Following a change of printer, from De La Rue to International Security Printers - Walsall, the recent low value 2018 prints constitute a non-visible change." Tallents House announced that six reprints would be distributed as 'Non-visible changes', ie a change of printer, on 23 May. These were the 2nd, 1st, 1st Large, 10p, 20p & £1 printed in February. A further batch of new values was announced for distribution in September, coinciding with Autumn Stampex, although a February printing of the 2p had been available some months earlier. The new values would be the 1p, 2p & 5p, and 2nd Large. The 5p and 2nd Large were printed in February as was the 2p that we already had. The 1p was printed in May - as was a second printing of the 2p. It was at this time that things started to get interesting, and hidden variations were discovered. The two printings of the 2p seemed to be quite distinct in appearance, either in the shade of green or by the appearance of the green in association with the iridescent printing ink. The other obvious difference was in the phosphor bands which reacted under a UV lamp as yellow on the original printing and blue on the later printing. John Deering referred to this in his Machin Watch column in the August 2018 edition of Gibbons Stamp Monthly. John identified that the five tariff-change stamps issued on 20 March have "a standard (dull) blue fluor which, under the DWUV lamp appears violet-blue". He then went on to cover the six counter-sheet stamps made available from 23 May. These he identified as "the 10p, 20p, £1, and 1st having the interesting yellow-hued fluor, the 2nd (CB) has the dull violet-blue, and the 1st Large has the brighter violet-blue". I expanded on this in the original blog post of 12 September, with further information based on more recent printings. This revealed that in addition to the 2p referred to above, May printings of the 1st class, 20p & £1 also reacted blue, compared with the yellow of the original February printings. Following this I received a very helpful email from IR which passed on the findings of John Brain, who had been looking at even more printings than I had. I ought to reiterate here that these findings are based on the use of either a short-wave lamp (the Uvitec Micro) or the Gibbons dual-wave ultra-violet (DWUV). Other SW lamps may produce different reactions, and the light must be shone directly at the stamp: the yellow does not show if the stamps are behind some transparent (Hagner-like) strips. John Brain revealed that on some stamps a yellow reaction could be obtained from the iridescent ink, evidenced particularly with the cylinder numbers, and that on just one printing of one stamp the colour ink glowed yellow, spectacularly revealed by the cylinder number, colour name and grid-box in the left margin, and the coloured identity number in the right margin. At this stage I have no idea as to the WHY? My first thought is that this is another aspect of the security features, and that Royal Mail revenue protection will have UV lamps to enable them to see if the stamps have a yellow glow to the ROYAL MAIL lettering. We await a response from Royal Mail! As to the What?, this is likely to change as new printings are made and discovered. It seems likely, though, that some values will only exist (as M18L) in one version, whilst others exist in two, or maybe even three. For instance, both Special Delivery stamps have recently been found (not yet examined) and are likely to exist in only one version. First some pictures. The first shows the 2p cylinder numbers side-by-side. On the left, the yellow-glowing phosphor and the non-reacting iridescent layer; on the right, the blue-glowing phosphor and the yellow-reaction iridescent ink. The lower pictures show the yellow phosphor of the first printing, on the stamps. These 10p, 20p & £1 pictures show the iridescent ink showing as yellow, with the letters ROYAL MAIL on the background clearly black against this yellow (a process in printing known as 'reversed-out' which is how newspapers show their titles in white against their red-tops, or white headlines in a black box). 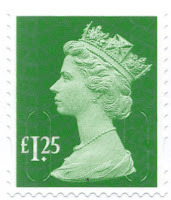 The most surprising printing is the second (6 February) printing of the £1.45 stamp, in which the Dove Grey ink has yellow fluorescence added, meaning that the ROYAL MAIL lettering shows as yellow, through the (normal) iridescent ink. The upper picture is this later printing, the lower picture shows the 10 January (blue phos) and 6 February printings side-by-side. The (yellow) lettering also shows clearly through the blue phosphor on the later printing, whereas it cannot be seen on the first printing. § indicates unofficial availability date from Tallents House, Post Offices, or Stampex rather than philatelic distribution. The five tariff-change stamps printed on 10th & 15th January have blue phosphor. The five reprints of these on 6th & 7th February also have blue phosphor but the £1.45 has yellow fluorescent colour ink. The low value printings on 9 February have yellow phosphor. The NVI sheets printed on 14 February have blue phosphor. The 8th & 9th May printings of the 1p, and reprints of other values including the NVI 1st class have blue phosphor and yellow fluorescence in the iridescent ink. As far as we know there have been no variations in business sheet printings or most booklets - reprints of booklets are much more difficult to find as one has to be able to see the unopened packets to check the packing date, and even then the pack may contain stamps from the same printing as an earlier one. Similarly business sheets are only available complete, and specific dates are not available from Tallents House, so examination at Post Offices is the only solution. The exception to this is the mixed booklets containing definitives coded MCIL. So far there have been five mixed booklets with M18L MCIL codes. The Royal Air Force pair, and the Dad's Army booklet had normal blue-phosphor stamps. But the Hampton Court and World War I (and, one supposes, the Harry Potter due on 16 October) have blue phosphor with yellow fluorescence in the iridescent ink, giving a similar reaction to the 10p (etc) shown above. Shown here are the Dad's Army (left) and Hampton Court booklets, side-by-side. The original version has the Norvic number 2936aC.8 and the later variant will be listed as 2936aC.8a and will be available on our shop soon. I doubt that this is the end of the story. I may have made errors in the above as I did in the earlier post, the 1st Large and 2nd Large are blue phosphor but with John Deering's 'minor hint of yellow'. When you've looked at stamps in the dark for an hour or so mistakes are made, so apologies for that. Please let me know of any other variants that are found, or any errors you think are in these tables. I have two very distinct 1st Class Large issues. One is clearly blue phosphor, the other duller and more yellowish, both from 23 May. The presumption is that these were both from the February printing, but it is equally possible that there was a later (pre-23rd May) printing that we don't know about. These were distributed by Tallents House, but where did yours come from, Dave, and in what formats? It seems unlikely (but not impossible) that TH would send two single stamps from different sources as part of the same customer order.